Serving more than ten years in the public interest sector, John Passacantando has been Executive Director of Greenpeace USA since September 2000. From the headquarters office in Washington, D.C., John leads a team of 72 and oversees an organization with 300,000 members in the U.S. and a budget of $20 million. Since 1971, Greenpeace has been a leading voice of the environmental movement and work throughout the world to protect oceans and ancient forests, and to fight toxic pollution, genetic engineering, global-warming and nuclear threats. With John’s commitment to aggressive and creative tactics, the organization continues to be known for its direct confrontation of corporations and governments as a means of forcing change. Greenpeace has satellite offices in San Francisco and Anchorage. Prior to joining Greenpeace, John rallied the grassroots movement to stop global warming as co-founder and Executive Director of Ozone Action. Founded in 1993 by John and Karen Lohr, formerly of Greenpeace, Ozone Action initially campaigned to strengthen the international effort to stop ozone depletion. Under John’s leadership, Ozone Action broadened its efforts and emerged as the largest organization focused solely on stopping global warming. He assembled a team that built grassroots support through aggressive investigative and media campaigns to address the public health, environmental and economic threats of global warming. The organization was dissolved into Greenpeace when John took the helm. Before founding Ozone Action, John was executive director of the Florence and John Schumann Foundation, helping focus its grant making programs on the grassroots renewal of democracy. John worked to support the Foundation’s efforts on campaign finance reform and environmental issues. Prior to making the leap to environmental advocacy, John fine- tuned his marketing and media skills while working in the corporate world. He worked as Director of Marketing for Polyconomics, Inc., providing economic analysis to the country’s largest institutional investors. He distilled tax law, interest rate and commodity price changes for more than 80 clients. Before that, he sold turnkey computer systems throughout New York, New Jersey and Connecticut for Triad Systems Corporation. John received a BA in economics from Wake Forest University and an MA, also in economics, from New York University. 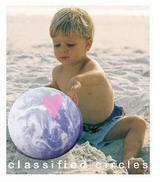 John has testified before Congress and participated in several PBS debates on global warming. In addition to interviews on Good Morning America and other news programs, John has been quoted in virtually every major newspaper in the United States and has had numerous op-eds published nationwide. 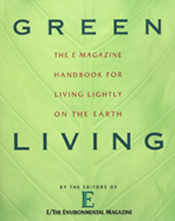 In 1999, he received the Tides Foundation 1999 Jane Bagley Lehman Award for Excellence in Public Advocacy for his work on global warming solutions. John is married to Lisa Guide, the Deputy Assistant Secretary for Policy and International Affairs and the U.S. Department of the Interior. They have two young daughters, Sophia and Mollie. Unfortunately we don't know -yet- how this new schedule will translate locally: 9, 10, 11 AM across the country. Many stations are now selecting the shows they want and it is up to them to decide when to air them. Our list of AAR affiliates airing EcoTalk provides you with email and phone number: ask them if/when they now plan to air the show and let them know your wishes and support for EcoTalk. Your call, your email can make a difference. Thank you in advance for your help and feedback. We'll get the latest on environmental health threats left in the wake of Katrina...what the EPA won't tell you about lingering risks to human health in the disaster zone. We'll also get an update from Washington on the embattled Endangered Species Act and meet a St. Louis man who packed up his family to head to DC for last week's protest against drilling in ANWR. His story - and what he learned from Americans along the way, will inspire you. Maurice Coman, Conservation Chair, Sierra Club Delta Chapter in Louisiana, Chair of the Sierra Club National Toxics Committee, and a resident of Metairie, LA. Brad Black who came with his family to Washington DC for Arctic Refuge Day. At last the climate chaos long predicted by scientists and environmentalists has hit U.S. shores in the form of high velocity Hurricane Katrina - but it's only a sign of whats to come, according to our guests. Due to a reorganization of our usual server (radio4all.net) we are unable to provide directly the recordings of each segment. You can access each by going to radio.indymedia that is for now hosting them. Thank you for your patience and understanding. John Rennie is editor-in-chief of Scientific American, which predicted the devastation in a 2001 article, Drowning New Orleans. 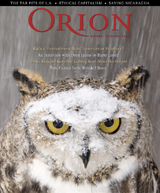 And don't miss their September issue, Crossroads for Planet Earth. Tom Knudson with NOAA speaks about his research about the impact of climate change on hurricanes. Mike Tidwell, author of the prophetic 2003 book, Bayou Farewell tells us why this cataclysmic event is another September 11th event that will either make, or break, this country. 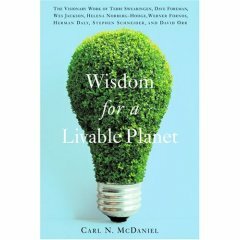 Carl Mc Daniel is the author of Wisdom for a livable planet : it encapsulates what we need to learn to survive. Enjoy! LISTEN to the whole program (37 min) hosted as usual by airamericaplace. Some of the links of our previous shows (before september 1) have been modified by the server that hosts them and they did not inform us of the change: therefore many broken links we are now trying to fix asap. Our sincere apologies and thank you for your patience and understanding. If/when you encounter a broken link, thanks for telling us so we can fix it. :) Just send us a comment from the related posting (that will greatly facilitate our tracking and fixing of the problem). This prophetic article by Mark Fischetti was published in the Scientific American of October ... 2001 and then featured on National Geographic TV: "A major hurricane could swamp New Orleans under 20 feet of water killing thousands. Human activities along the Mississippi River have dramatically increased the risk, and now only massive reengineering of southeastern Louisiana can save the city."